Canada's Wonderland is Fun for Everyone. First and foremost, Canada's Wonderland is about fun. Fun for everyone. Here you'll find everything you need to know about navigating and enjoying the park and all of its experiences for those with disabililities. And if you can't find the answers here, feel free to download our Guest Assistance Guide or stop by any of our Guest Services areas at the front gate or throughout the park. Canada’s Wonderland’s Ride Admission Policy and Alternate Access Entrances are designed to help you safely experience our facilities and provide equal access to all guests. The safety of guests and associates is our #1 priority at Canada’s Wonderland. Safety is a shared partnership between the park and our guests. Not everyone can safely enjoy every ride. Guests are asked to review and carefully consider the ride restrictions using good judgment. However, we reserve the right to make the final decision regarding the eligibility of a rider based on a person’s size, weight, willingness to ride, or other limitations. Please refer to your individual Rider Access Form for rides that will safely accommodate you. If you require the use of an Alternate Access Entrance, please visit Guest Services or Ride Accommodations to obtain a Rider Access Form, Boarding Pass, and Guest Assistance Guide. The Guest Assistance Guide explains the ride entry guidelines and procedures and provides specific information related to each attraction. Alternate Access Entrances are intended to accommodate guests with mobility restrictions or Autism Spectrum Disorder (ASD) and not to bypass others waiting in line. This service is available for a guest with restricted mobility or ASD and up to three companions. To provide equal access for all guests, we have developed a Boarding Pass Program which allows guests with mobility restrictions or ASD to access rides at specified times via the Alternate Access Entrance (usually a ride’s exit) in order to avoid crowds and waiting in the regular lines. At Behemoth, Leviathan, and Wonder Mountain’s Guardian, the boarding time can be obtained from the ride associate at the front of the ride entrance. Guests who are in possession of a Boarding Pass will obtain a boarding or “ride” time on the Boarding Pass that is equal to the anticipated wait time for a particular ride from the ride associate at the Alternate Access Entrance (usually a ride’s exit). Guests can then choose to rest comfortably away from the queue area, visit a shop, see a show, or play a game until their boarding time. Information on where guests access the ride is posted on each ride’s Rider Safety Guide sign. All guests, regardless of point of access, are required to meet all riding requirements for the ride, including height and medical restrictions in order to ride/ participate. The guest with a mobility impairment or ASD should visit Guest Services or Ride Accommodations upon his/her arrival at the park to express his/her inability to wait in the regular line. Some questions are asked to ensure that the rider has the required physical criteria in order to safely experience rides, and a Boarding Pass is issued for the guest in question and up to 3 riding companions. Due to the nature of the attractions in Splash Works, Alternate Access and Boarding Passes are only available at the Lazy River via the exit. Boarding Passes, however, are required for Halloween Haunt Mazes if the Maze has a line. Present the Access 2 Card when purchasing tickets with your support person at Guest Services or tickets sales located at front gate. The individual with the disability pays regular admission and the support person receives his or her admission free. Who is a support person? A support person is an individual who accompanies a person with a disability to provide services that are not provided by employees, such as assisting the person with eating, administering medication, communication needs and use of the facilities. I work for an organization where staff takes groups of people with disabilities to the movies and attractions. Can my organization get a card for staff use? Cards are only issued to individuals who have a permanent disability, and who require a support person. Access 2 Program does not provide cards for organizations or staff cards. You may be asking yourself whether Canada's Wonderland is appropriate for guests with an Autism Spectrum Disorder (ASD) or whether your loved one on the spectrum will be able to handle the theme park experience. Canada's Wonderland has taken steps to be well-prepared to welcome and provide accommodations for all types of disabilities, including autism and related disorders. To continue to provide equal access for all guests, be aware that all guests with mobility impairments or ASD will now receive a Ride Boarding Pass with wait times. Please review the Boarding Pass Program for more details. As you know, advance planning is a requirement for any successful theme park visit with a person with ASD. 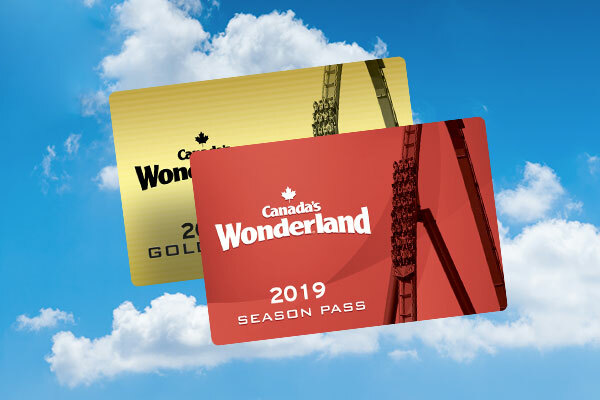 Your visit to Canada's Wonderland will include a plethora of sensory stimulation including crowds, dark and loud theatres, coasters travelling overhead, lights and noises, waiting in line, to mention a few. At Canada's Wonderland, we strive to provide equal opportunity to all of our guests while providing a variety of options tailored to specific needs. Our highly trained staff is knowledgeable and eager to assist. You can find information on our rides, shows and attractions in advance on the website. The Park’s Guest Assistance Guide is also available for download. The Guide outlines the specifics about each attraction, including height requirements and health restrictions. Another good resource is the article "How to Enjoy the Amusement Park" from the Autism Society. Feel free to contact Guest Services in advance at (905) 832-8131 with any additional questions. Download a printer-friendly version of this information. When you arrive at the Park, please proceed to Guest Services located at the Front Gate. We also offer a Parent Swap policy at the rides. This allows one parent to ride while another parent waits with the child. When the ride is complete, the parents swap child responsibility at the exit. Additionally, if you need to rent a stroller, wheelchair or locker, proceed to Stroller, Locker and Wheelchair Rentals on the South side of the Front Gate near the washrooms. Canada's Wonderland offers our guests several restful attractions and quiet places that your party can enjoy during the day. The Park has a First Aid Station near the washrooms in Medieval Faire and Family Care Center (Lost Parents) in Planet Snoopy and our Front Gate Guest Services location. Additionally, air conditioned restaurants provide a nice break from the sensory stimulation. 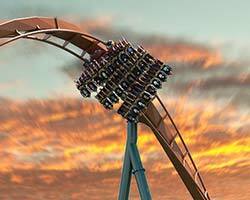 Canada's Wonderland is a wonderful destination for families and friends to visit. Our goal is to make your experience at the Park both smooth and full of family-fun. Please let us know if you have any further questions by contacting (905) 832-8131, emailing guestservices@canadaswonderland.com or by talking to a Guest Services representative at the Park. Canada’s Wonderland is dedicated to providing world-class customer service to all guests visiting Canada’s Wonderland and making it fully accessible to all members of the community and to offering a fair and equitable employment experience. Canada’s Wonderland’s Accessibility Policy supports the full inclusion of persons with disabilities as set out in the Canadian Charter of Rights and Freedoms, Ontario Human Rights Code, the Ontarians with Disabilities Act (ODA) 2001, and the Accessibility for Ontarians with Disabilities Act (AODA). Canada’s Wonderland is committed to giving all guests with disabilities the same opportunity to enjoy and benefit from our services and attractions in a similar way as other guests. The Company is equally committed to providing accommodations to persons with disabilities so that they may pursue and enjoy employment opportunities in a similar way as other applicants and employees. Policies have been prepared that outline the Company's compliance with AODA regulations and what our guests and employees may expect from us. They are intended to benefit all disabilities, whether readily apparent or not, and to ensure that everyone is treated with courtesy and respect. Canada’s Wonderland Ride Admission Policy and Alternate Access entrances are designed to help guests with restricted mobility safely experience the rides. For information regarding Ride Admission Policy and Alternate Access entrances, please download our Guest Assistance Guide. To better assist guests who have a hearing impairment, Canada's Wonderland has a TTY device that can be reached at (905) 832-7503. For guests with vision loss, a braille guidebook with park information is available at Front Gate Guest Services. A select number of these guidebooks are available and must be returned at the end of each visit. We also have a Guest Assistance Guide for Guests with Disabilities in braille format available at Front Gate Guest Services. Accessible Parking is available for vehicles with valid permits on either side of the Front Gate plaza. Wheeltrans or other transportation may drop off guests with disabilities at Front Gate. An entrance for guests with mobility disabilities is clearly signed at the Front Gate. Private washroom facilities for guests needing the assistance of another guest are available at all family washroom locations. Wheelchair accessible stalls are located at all washrooms. All main restaurant locations are accessible to guests in wheelchairs. Some food service locations throughout the Park may present difficulties for guests in wheelchairs. Please ask our employees for assistance at these locations. Guests with vision impairments may ask our employees for assistance with obtaining information on menu items and prices. Our employees will be happy to assist with orders and bringing items to tables. A limited number of wheelchairs and electronic convenience vehicles (ECV) are available for one day rental. All wheelchair/EVC rentals may be secured online in advance of your visit, or at the park while supplies last. It is recommended that guests bring their own wheelchairs. A one day rental of a manual wheelchair is $15.99 plux tax (+ $5 refundable deposit) and an ECV is $49.99 plus tax (+ $50 refundable deposit). The deposit is refunded upon the satisfactory return of equipment. Oversized change/dressing rooms are located in the Splash Surf Shop and the Locker Room retail stores. Guests with mobility disabilities, or who need a support person with them, can utilize these rooms. Guests with casts and braces will be restricted from riding rides where the cast or brace will not fit inside the ride unit or where it will present a hazard to the guest or others. Guests with full arm (elbow restricted) and full leg (knee restricted) casts or braces are restricted from most rides and water slides at Canada’s Wonderland. We suggest you delay your visit until the cast is removed. Braces with exposed metal parts are not permitted on select slides in Splash Works. Casts of any kind are not allowed on Behemoth, Leviathan, Muskoka Plunge, Sledge Hammer, Soaring Timbers, Super Soaker, and The Plunge. Any type of foot or leg cast is not allowed on Backlot Stunt Coaster and Time Warp. For additional information, please download our Guest Assistance Guide. Guests with any type of prosthesis should not ride unless they can ensure the device is properly secured and will remain in place during the ride. All riders must be able to maintain the proper riding positioning. Prosthetic devices with exposed metal parts are not permitted on select Splash Works attractions. Guests should visit Guest Services or Ride Accommodations prior to riding to ensure a safe riding experience. Additional manufacturer restrictions may limit some guests from participating on certain attractions. Guests with prosthetics enjoying their day at Splash Works should consult with a member of our Aquatics Supervisory team. Magnetics are used at the following attractions: Backlot Stunt Coaster, Behemoth, Drop Tower, Leviathan and Wonder Mountain’s Guardian. Guests with medical devices sensitive to magnetic fields (pacemakers, hearing aids, etc.) should consider these factors when deciding to ride. Due to the dynamic nature of rides, oxygen tanks are generally not permitted on most rides. Guests can ride both Antique Carrousel and Character Carrousel in a chariot. Guests with smaller oxygen tanks which are secured to the rider may also ride Boo Blasters on Boo Hill, Flying Canoes, Frequent Flyers, KidZville Station, Jokey’s Jalopies, Jumpin’ Jet, Sally’s Love Buggies, Snoopy’s Revolution, Snoopy’s Space Race, Snoopy vs. Red Baron, Swan Lake, The Pumpkin Patch, and Treetop Adventure. Oxygen tanks are permitted in all restaurants, shops and entertainment venues. Many attractions utilize special effects including strobe lighting and specialty ride lights that may impact guests with certain medical conditions. Attractions utilizing these effects include: Behemoth, Boo Blasters on Boo Hill, The Fly, Ghoster Coaster, Leviathan, Soaring Timbers, Taxi Jam, Thunder Run, WindSeeker, and Wonder Mountain’s Guardian. Additionally, during Halloween Haunt, these types of lights are used in scare zones and mazes. Canada’s Wonderland’s show, special event, and catering venues are accessible to guests with disabilities. There are viewing areas to accommodate guests in wheelchairs although they are limited. Please speak with an usher in advance for assistance with entrance and seating for the guest with a disability and other members of the guest’s party. Arthur's Baye - Wheelchair seating available near The Marketplace Buffet. International Showplace - An outdoor amphitheatre with tent covered bench seating. Wheelchair seating available at the front and rear of the house. KidZville Playhouse - An outdoor children's theatre with tent covered bench seating. Wheelchair seating available at the rear of the house. Canterbury Theatre - An indoor, air-conditioned theatre with wheelchair seating available at the front, middle, and rear of the house. Service animals are welcome at Canada’s Wonderland. A service animal is defined as a dog or miniature pony that has been individually trained to perform tasks for a person with disabilities. We may ask you what task your service animal performs for you. Service animals must be physically controlled on a leash or harness at all times while on our property. There is a limit of one service animal per guest. Due to the nature of most rides, service animals must remain with a non-riding member of the guest's party. Canada's Wonderland ride attendants are not permitted to take control of service animals. Guests whose service animals demonstrate aggressive actions toward our guests or employees will be directed to remove the animal from the Park. Service animals are not permitted in water attractions, wet decks, wading pools, or lazy rivers. Service animals may be taken on Antique Carrousel and Character Carrousel. Please stop by Guest Services for more information. Our First Aid Centre is staffed at all times during Park operating hours. Refrigeration for medication, with the exception of bee sting anaphylaxis kits, is available at First Aid, and medical equipment can be stored. The First Aid Centre is located behind Spinovator in Medieval Faire. Complete information, including Rider Height Requirements is available in the Guest Assistance Guide. 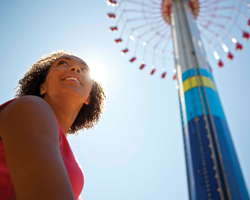 Read “How to Enjoy the Amusement Park” from the Autism Society.